Here we are in Freedom, New Hampshire. 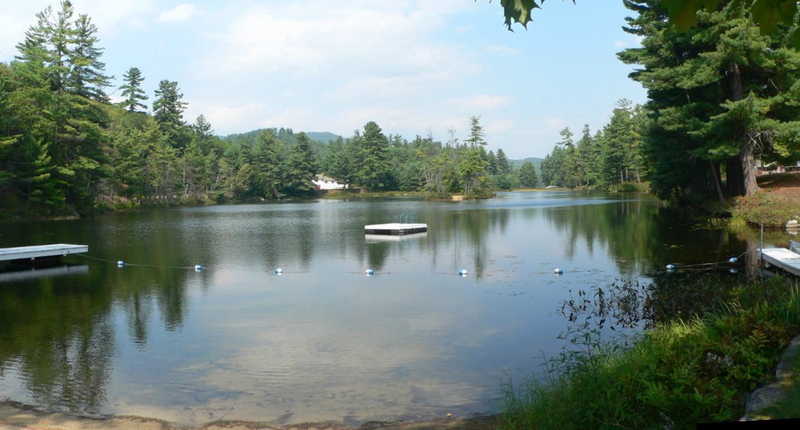 On the shore of Lake Ossipee and a short drive from the White Mountains. 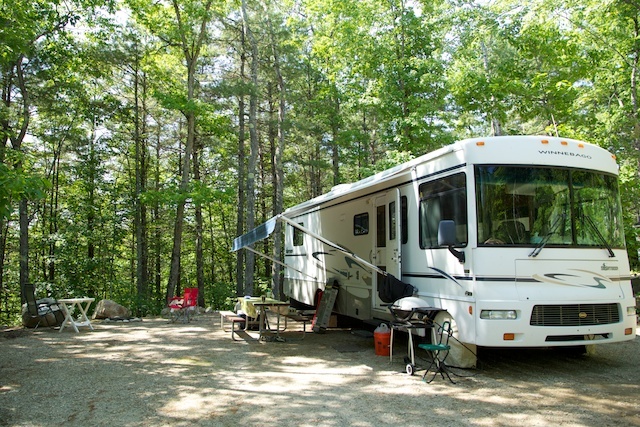 We have set up base camp on our shady, expansive site and settled in for a Summer of exploring New Hampshire and Maine. Think covered bridges, waterfalls, lake fishing and mountain hiking and you’ll have a good idea of our plans. Click the follow button below and enter your email to follow along. The trip here was circuitous but fun, seeing new areas and visiting friends. But we are ready to get off the road for a while and relax. Posts of our adventures here will be interspersed with diary entries of past trips, so don’t get confused if you don’t know where we seem to be. We are right here for now, waiting for the leaves to turn. Looks nice ! Ohana’s is closed down. Have fun, see ya soon ! Hi, having fun, raining now and through tomorrow. Heard about Ohana. Love to Eve. I went on a solo road trip through New England and stayed on a place called “Country Bumpkins” near the white mountains! I hiked a trail called Lonesome Lake and was the only person on the trail. Your site looks lovely! Hi, I’m familiar with the spot but haven’t hiked it. Franconia area is on other side of the White mountains. Too many trails, too little time. Posted this afternoon about a recent hike to Arethusa Falls (https://redroaddiaries.com/2012/06/17/not-mary-shelleys-frankenstein/) I am really enjoying following your blog…you are very adventuresome, a trait I admire. What a glorious campsite you’ve found! You’re going to have a wonderful summer – can’t wait to read all about it! Thanks, glad to have you along. What a beautiful campsite!! Completely different from the brush of southern Texas that we are currently enjoying!! We hope to be spending next summer exploring Maine!! How perfect!! We can see it through your eyes first!! Enjoy!! Thanks. That’s what is nice about being on the road, the diversity of scenery. There is life after Texas, though you saw some great sunsets. Oh wow, it looks so nice!! Great pictures, thanks a million for sharing! You missed the black fly season. Timing is everything. I wasn’t so lucky at the ocean this morning, whatever the green-headed monsters are called. Fact is, beauty usually comes at a price. Even here in New England. So true. I’m familiar with those green-headed fellows. They like to follow along and annoyingly buzz your head. They can spoil a good walk. I finally figured out how to find your blog! Yea! Thanks for your comments and “likes”. The lake looks so inviting and COOL! Hit 98 here yesterday with heat index of 104—YUK! What a nice camping spot. Thanks fpr stopping by my blog. I am sitting/sweating on a porch in FL… that water is calling to me! I know that feeling, air you can wear. Stay cool and hydrate. Thanks for checking out my site http://www.leslieartstudio.wordpress.com where you came across my New Hampshire paintings from June. If you can’t get inspired in the White mountains you may want to check your pulse. Have fun! Liked your work. Since I have also been hiking these White Mountains I find myself checking my pulse quite a lot. You ‘liked’ my first post and that’s what led me to your blog. That, and the fact that my husband and I are planning a rather last minute, end of summer before- I -go- back- to -teaching, trip to Maine! But, we don’t have an RV – it will be 9 days of driving, viewing, eating, moteling, writing, etc. I’ll come back and ask more specific questions about towns we are thinking of traveling through. I spend about an hour reading blogs and liking ones that strike me positively, particularly like to encourage new blogs.” Likes” are the motivators and indicators of how you are doing. Thanks for the “like” and many safe travels! Come on over, but you have to bring some of those scones…. Such a wonderful way to summer! Thanks for the “like” of my post. We summer in Washington, NH which is where the lake photo was taken, along with the young fishermen, and the chicken. We are in Freedom until the leaves start to change then we will take off, we love the area. What a fantastic place to set up camp. The water looks very inviting. How was the fishing? The fishing is good, but varies day to day. But in such a pretty spot you don’t mind. Tempting, almost made me want to start RVing again. Maybe after a break?? You can ride along with us for a while.